Alamo Theatre same as Dosta? 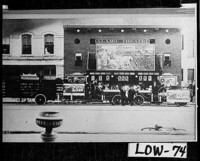 In this picture of the Alamo Theatre in Valdosta in 1922, note the round windows in the brick front. Compare to the round window visible just past the Dosta marquee in the previous post. Is this the same building?